FNC's RPI is the mortgage industry's first hedonic price index built on a comprehensive database that blends public records of residential sales prices with real-time appraisals of property and neighborhood attributes. As a gauge of underlying home values, the RPI excludes final sales of REO and foreclosed homes, which are frequently sold with large price discounts, often reflecting poor property conditions. The table below shows seasonally unadjusted month-over-month (MOM) and year-over-year (YOY) changes in three RPI composite indices. The national index is based on recorded sales of non-distressed properties (existing and new homes) in the 100 largest metropolitan areas. All three indices were up by more than one percentage point at a seasonally unadjusted rate, moderating slightly when compared to April, particularly by the narrow 10-MSA composite. 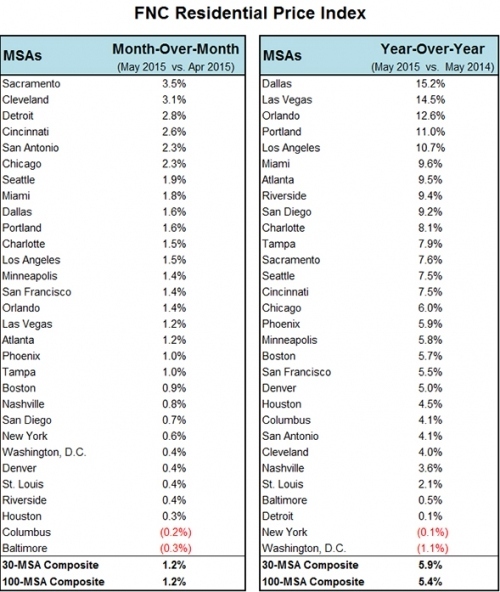 Year over year, prices are rising by 5.4 percent nationwide. The hedonic procedures used to create the index are described in "Hedonic versus repeat-sales housing price indexes for measuring the recent boom-bust cycle," by Dorsey, R.E., Hu, H., Mayer, W.J., and Wang, H.C., Journal of Housing Economics 19 (2), 75-93. 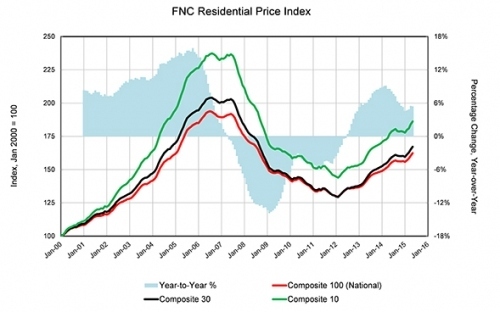 The FNC National Residential Price Index is a volume-weighted aggregate price index consisting of 100 major metropolitan areas across different regions of the U.S. All FNC Residential Price Indices are constructed to capture unsmoothed home price trends. 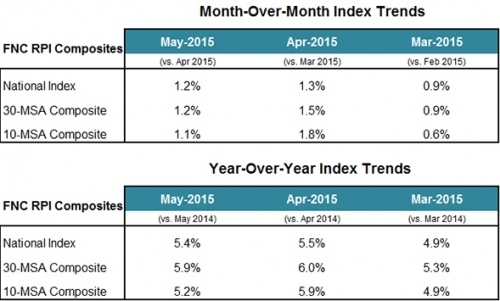 The chart below tabulates the latest MOM and YOY price trends for each MSA in the FNC 30-MSA composite index. For more information, visit www.fncinc.com.